Our team is working hard to always provide you with the ultimate user experience and improved functionality. 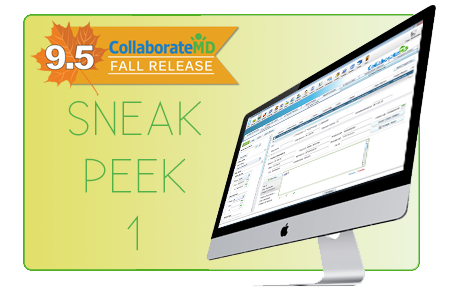 CollaborateMD is excited to announce the General Availability of our v9.5, available now! Get ready for New Interactive Dashboard Enhancements, User Print Statement Enhancements, and the ability to implement Multiple Fee Schedules. Please watch for upcoming communications that will include additional sneak peeks, tools to master v9.5, and free webinar(s) on upcoming features.